The Music Group plays at the "Sunday First" service on the first Sunday in each month, also at the Sunday evening Youth Praise services held on four or five occasions each year. 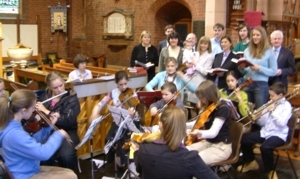 At the Eucharist on Palm Sunday 2004 the Music Group were joined by the Choral Group. New singers or musicians will be made most welcome.